Make your evergreens in containers last year after year with this clever strategy. Evergreens in pots are a great look for flanking front doors or using as accents elsewhere in the yard, but in Iowa, they will freeze solid in winter, killing the plant and possibly shattering the pot (even if it's plastic). 1) Dig a hole in a protected spot near a building or your compost heap. 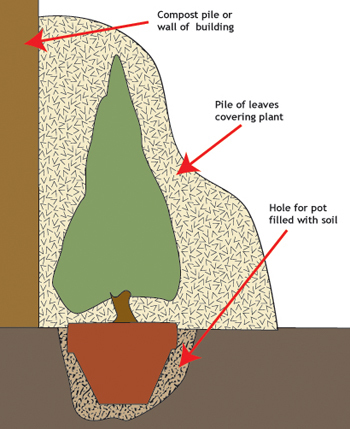 The hole should be just deep enough to accommodate the entire pot. 2) Then heave the pot into the hole. Or, to save your back and better protect the pot, just pull the tree right out of the pot. (Store the pot in the garage or other sheltered place.) After a summer in the pot, the rootball will be tightly woven enough to hold the soil in place. 3) Toss in loose soil or compost in around the plant. (It's fine if there's lot of autumn leaves and other loose material mixed in.) Water well to prevent the plant from drying out during winter. You can leave the evergreen this way until the end of November or so, or whenever harsher winter weather and snows set it. At that time, it's preferable to also protect the top of the plant to prevent winter burn. 4) Wrap the top in burlap or--even easier and cheaper--is just to pile on loose autumn leaves. Use large branches, pieces of scrap lumber, chicken wire, large tomato cages, or just about anything else to hold the leaves in place.